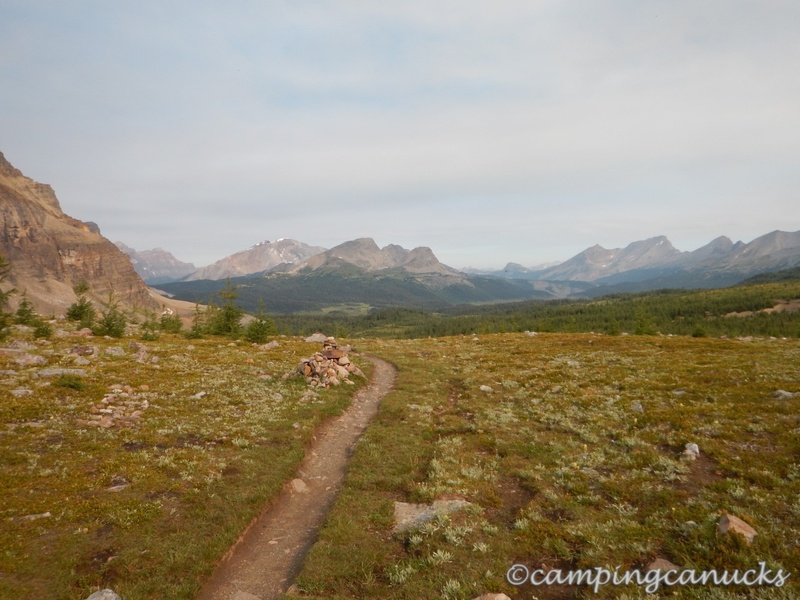 Our last day at Assiniboine (Day 5) started as the smokiest day since we had arrived three days before. Since it had not rained the previous evening (unlike every other night), the air had not been cleared of smoke. That meant that everything in the morning had a slight reddish hue to it. With a planned departure time of noon on the helicopter, we got up bright and early and quickly packed up our site after we had a fast breakfast. 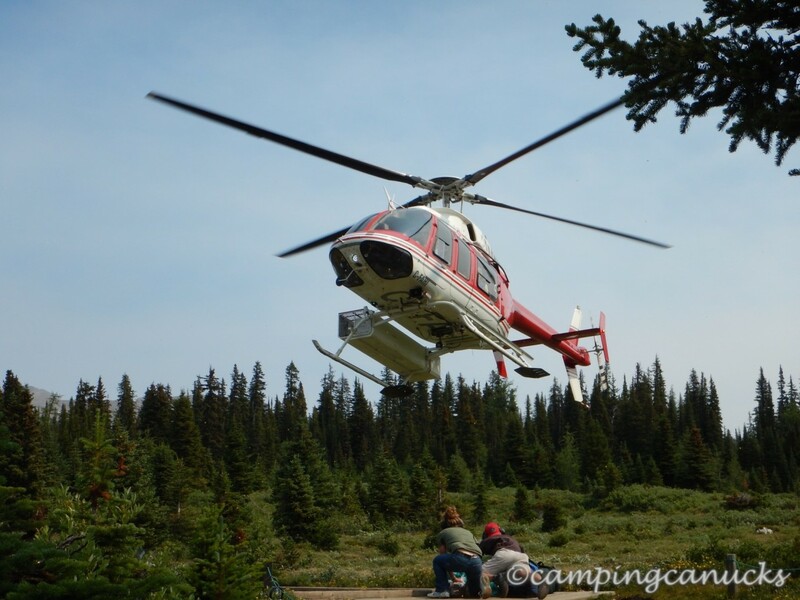 As the helipad was near the lodge, we planned to take our packs that way and then head for Wonder Pass. Being that the trip is rated as an easy 5.5 km hike from the lodge, we expected we would be able to knock the hike off with plenty of time to spare before we flew out. Due our encounter with the bear the day before, we opted to take the high trail to the lodge and made sure that we were making lots of noise as we headed down the trail. We did not see any more bears which suited us both just fine. Just a rabbit. 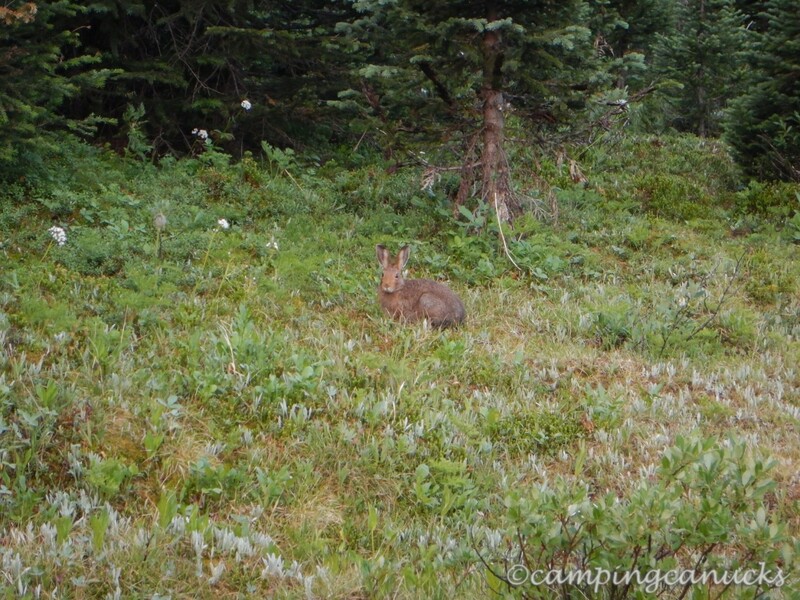 A rabbit that didn’t seem to care about us and just continued with the business of eating. 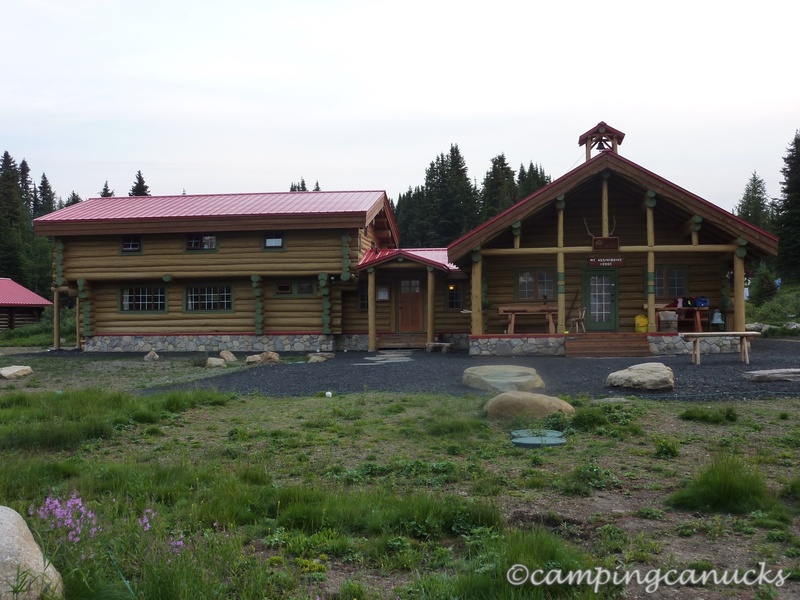 Shortly afterwards, we arrived at the lodge. One of the lodge staff had advised us that the best place to leave our heavy packs unattended while doing the Wonder Pass hike was in the cook shelter at the Naiset Huts. These are a number of huts that anyone can reserve and use to stay at Assiniboine rather than staying at the lodge or in a tent. We would like to stay at the huts someday but we found that they are generally booked many months in advance so you really need to book early to have a chance at getting one. The trail to Wonder Pass started with a gentle climb through the meadows and the subalpine forest and along the way, we passed the other lake in the ‘Og’ series, Gog Lake. It should be noted that there are three with similar names: Og Lake, Gog Lake, and Lake Magog. 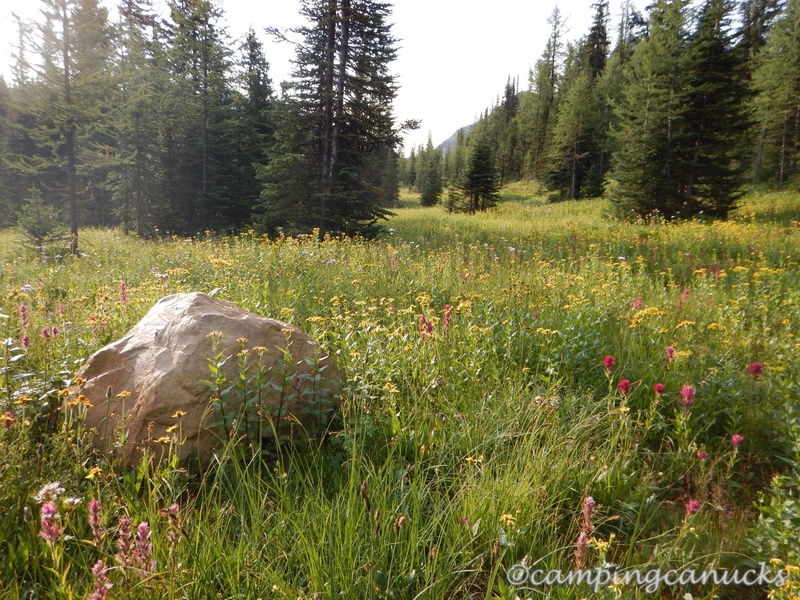 There were many flowers in bloom along the way as well, scattered throughout the many meadows. Shortly after passing by Gog Lake, we entered the trees for the steepest part of the trail leading up to Wonder Pass. With a light pack and after having done some strenuous hikes in the days before, it really wasn’t too bad. We’re sure a backpacker with a full load might disagree with us. At one point we passed Wonder Falls, but at this time of year it’s somewhat underwhelming as there is not a lot of water coming down. In the spring it probably is quite a sight to see. Once we cleared the trees, it’s only a short distance to the top of the pass. There are some good views to be found looking both north and south as there are no trees up here. It can be quite chilly but on this day, it was nice and warm. On a previous trip, I remember there being a really cold wind that just bit right through me. 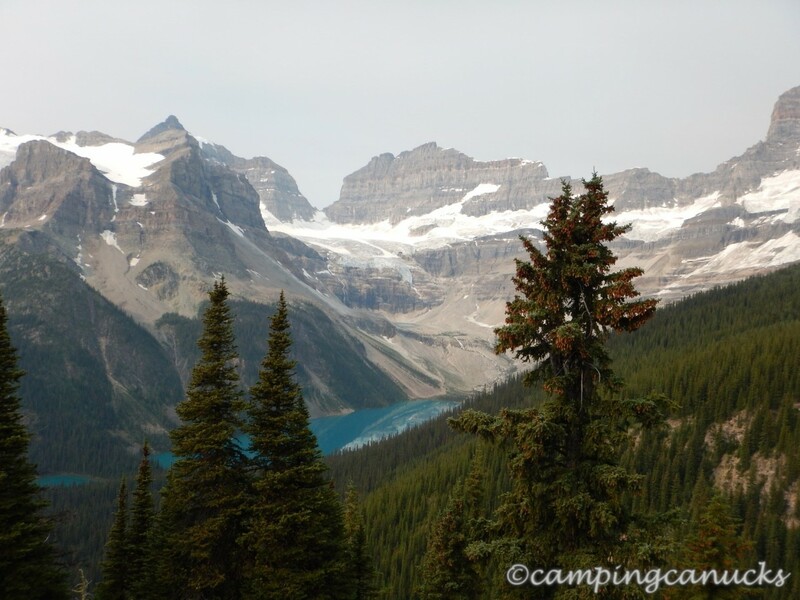 The top of Wonder Pass is also both the boundary between BC and Alberta, and the boundary between Mount Assiniboine Park and Banff National Park. There is a post at the top proclaiming Assiniboine’s World Heritage Site status. 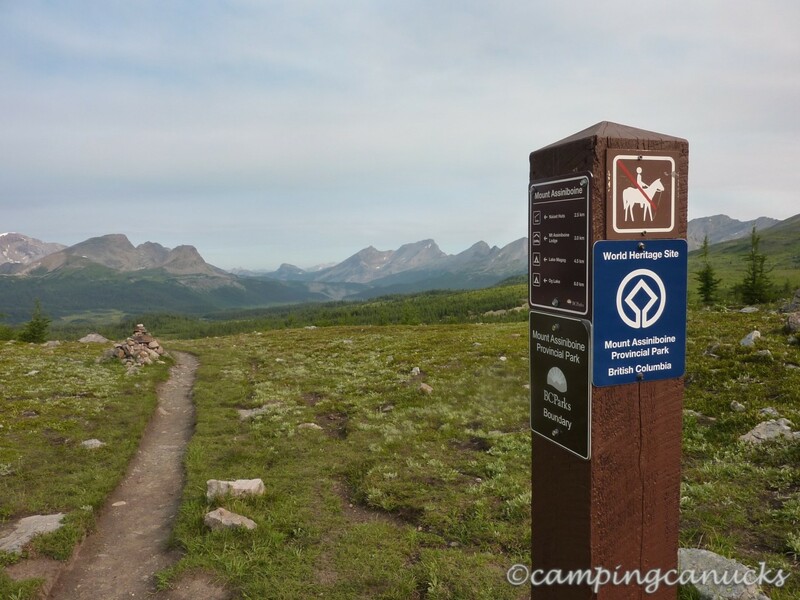 And as the sign says, horses can’t come this way from Bryant Creek; they must come over Assiniboine Pass, which was the route we took to get in. 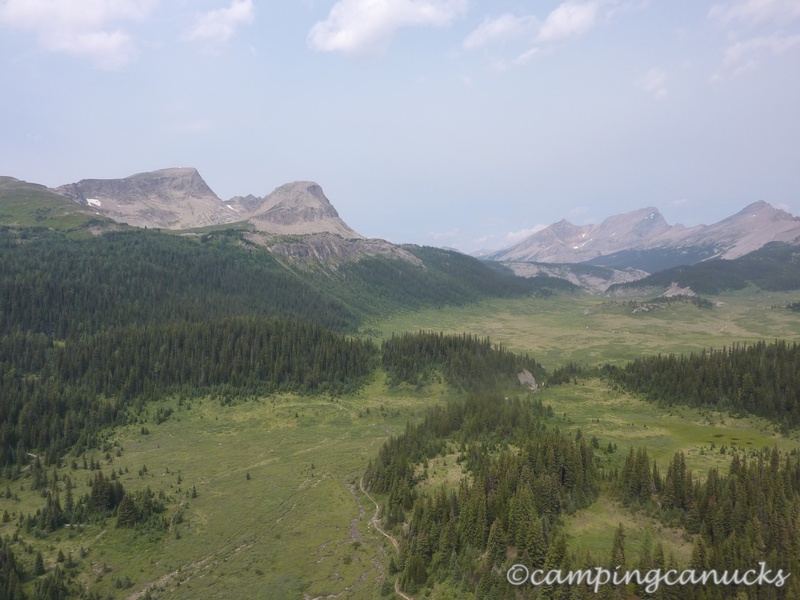 For a good scramble, you can head up Wonder Peak from this point (as I did on another trip) for some great views of the valleys around Assiniboine as well as Marvel and Gloria Lakes. One this day, though, we were headed to the viewpoint that overlooked Gloria Lake. From the pass, it was a descent back into the trees on the south side of the pass. 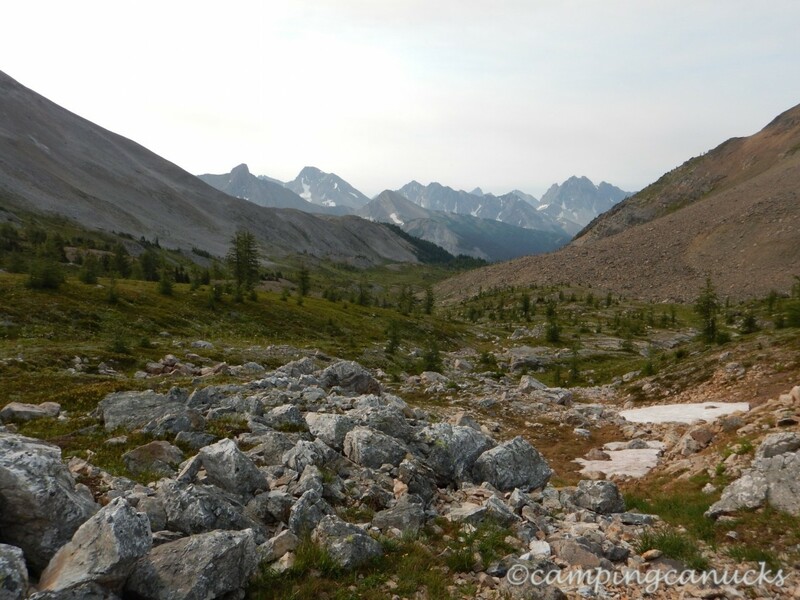 We did notice some cairns along the way that revealed trails that wove their way up onto the ridges around us. Something to explore on another day. A few kilometers from the top of the pass, we came to the viewpoint. It was good, but we can’t really call it great as there were lots of trees impeding the view. Our suggestion for the best views of Gloria Lake and the surrounding area is the scramble up Wonder Peak instead. We took a bit of break here and then started on our way back to give us plenty of time to catch our flight. On the way back, we met quite a few day hikers out for the view and backpackers on their way to Bryant Creek via Wonder Pass. It didn’t take us too long to get back to pick up our packs and head for the helipad. We learned, though, that our flight had been delayed by at least an hour so now we just had some time to kill. It’s hard to just sit around doing nothing after spending most of five days on our feet. Not to mention, we all really wanted showers. With clean clothes being a close second on our list. Well, maybe bacon was but clothes were definitely up there. After five days, we were getting a bit ripe. Eventually the morning wore on and we got to watch the helicopters come in, drop people off, and take people out until it was our turn. Funnily enough, we got to fly out with the garbage. The last time I had flown from the lodge back to Canmore but this was a shorter trip back to the Mount Shark Helipad near where we had hit the trail five days earlier. Flying over Bryant Creek almost seemed to trivialize our two days of packing in, especially since we were back at the trailhead in less than 15 minutes. A quick jaunt back to our vehicles and it wasn’t long before we were heading on our way back to Canmore for bacon and eggs, hot showers, and clean clothes! 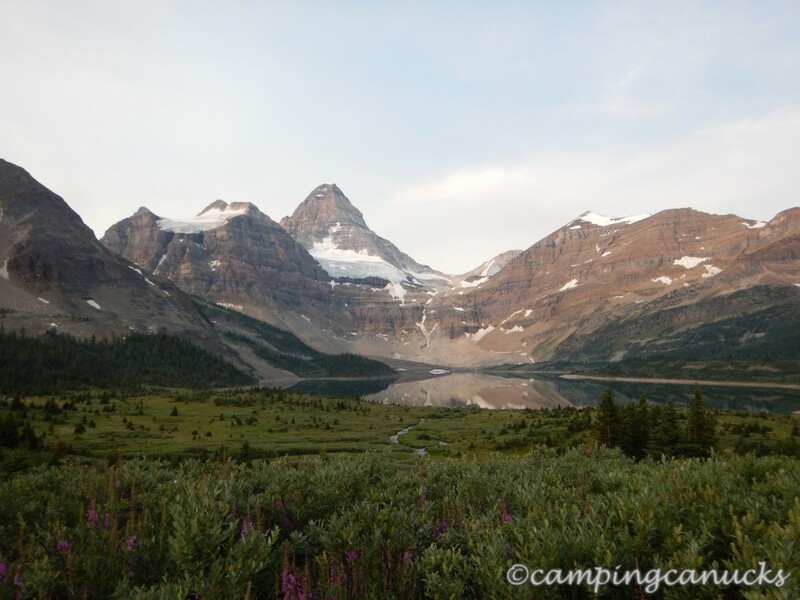 And so came to an end our trip to Mount Assiniboine in the summer of 2014. 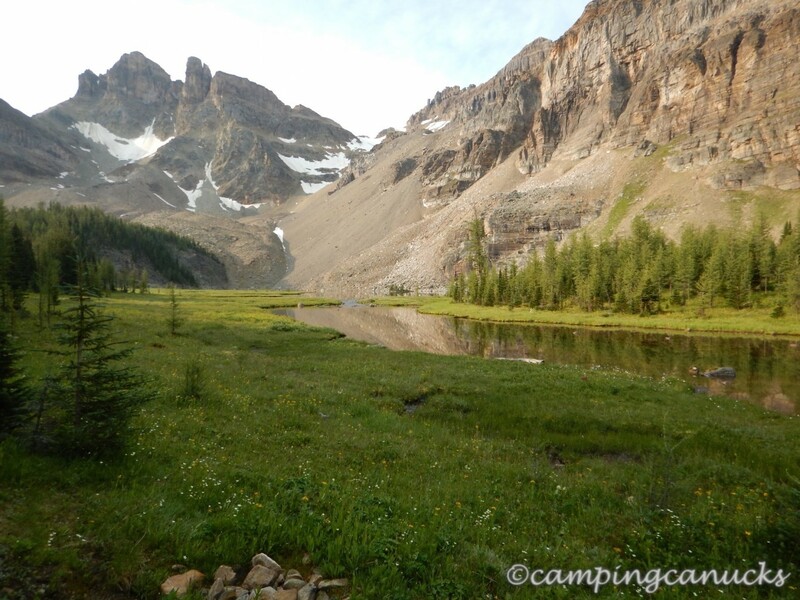 This is one of our favourite places to be in the Canadian Rockies and we do plan to come back some other day. There is still plenty left to explore. We figure we’ll probably come later in the season and fly both in and out and perhaps score a hut instead of staying at the Magog campsite. That said, the Simpson River/Ferro Pass, and the Mitchell River routes are still waiting to be explored as other ways to get to Mount Assiniboine. I’m going to need new boots.